Are you getting ready for a long-distance, overseas flight? If you ever traveled across multiple time zones, then you know that the struggle to overcome jet lag is real. Everyone has their own trick for overcoming (or preventing) jet lag, ranging from homeopathic No-Jet-Lag pills, to a magical Glo to Sleep mask, to forcing yourself to stay awake for 24+ hours before going to sleep at your destination. But maybe there’s a simpler way. 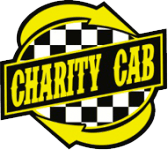 We’ve had a lot of passengers in our cabs over the years, and recently one of our drivers had a conversation with someone who had just gotten off of a 10 hour flight. And what was her remedy for beating jet lag? Yoga. That’s right – she recommended practicing yoga as a way to calm the mind and help beat the fatigue that jet lag so easily brings. Are you eager to try it out for yourself? Check out these five jet lag yoga poses to prepare for your next long-distance flight. Sukhasana is also known as the Easy Pose or Comfortable Seated Pose. 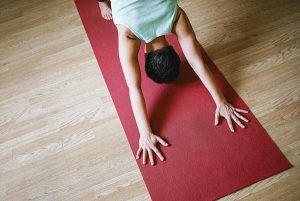 This is a great yoga remedy for jet lag because it helps ground you in the moment, allowing you to focus on sitting with a straight back and good posture. The pose also opens up your hips, which will feel amazing after 10 hours of sitting still in a small airplane seat. The great thing is you don’t need any props for this position – just a nice place where you can sit comfortably. You can even practice this pose before boarding the plane to help put your mind at ease – or just after arriving your destination, while waiting for your transportation to arrive. Also called the Supine Spinal Twist, Supta Matsyendrasana is another beginner-level yoga pose to help with jet lag. It requires enough space for you to lie down flat (comfortably) and spread your arms and legs out. This pose is great especially if you have lower or upper back pain, as the stretch opens up and loosens your back muscles and spinal cord. The simple twisting movement has many residual health benefits – stress relief, improved digestion, and kidney stimulation being the most prominent. After sitting still in a cramped space, it’s important to give your spine some love and relieve the stresses brought on by airline travel. Bhujangasana (more commonly referred to as Cobra pose) is a super simple, super effective yoga pose for kicking jet lag before it kicks you. This easy, beginner-level yoga pose does a lot with just a few simple movements. You’ll notice the immediate stress-relief as your heart and lungs open up – and your stomach, too. Again, this is a great move to stretch out your spinal cord after having stayed relatively unmoving for the duration of your flight. Viparita Karani (aka Legs Up the Wall pose) does require that you have space to lie down with your legs (obviously) up against a wall. You might look a little big funny doing this pose in public – but you better believe that the relief it gives you is well worth any funny looks you might get from passersby. Sitting in an airline seat for hours at a time means that you’ll get fluid retention in your ankles and lower legs (this is especially true if you’re flying while pregnant). Viparita Karani can help alleviate swelling by allowing fluid to travel away from your ankles. This pose also alleviates stress, and many people who practice this pose report that their headaches go away and mood improves. One final method to try is Yogic Sleep, or Yoga Nidra, which is said to offer the benefits of hours of sleep in just 45 minutes. This is a form of meditation that was developed by yogis as a way to obtain a state of consciousness that is neither asleep or awake, but somewhere in-between much like lucid dreaming. There are a variety of apps and tracks you can use to help you achieve yogic sleep, so you’ll have to find one that works best for you. This method takes practice, as you can’t just magically enter into Yogic Sleep on the first try. You’ll also notice how difficult it can be to turn off the noise of the outside world as well as the chatter of your mind. But, if you can practice yogic sleep, we recommend trying it during your flight in order to alleviate the severity of jet lag. What are you favorite jet lag yoga poses? So, is yoga a remedy for jet lag? It doesn’t hurt to try out the above poses before, during, and after your next long-distance flight and find out for yourself. If you already practice yoga for jet lag, we’d like to hear about it! Share your favorite jet lag yoga poses in a comment below.